Seeing His devotee’s desire to increase His loving service, Lord Krishna responds in a most glorious way. When Sri Chaitanya Mahaprabhu visited South India on His tour of the holy places, He visited the Sri Rangam Temple. In front of the Deity He chanted and danced in ecstatic sankirtana. The head priest of the Sri Rangam Temple, Sri Vyenkata Bhatta, was very much impressed with Sri Mahaprabhu’s love of God. After Mahaprabhu’s kirtana, Vyenkata Bhatta invited Him to his house. There he requested Mahaprabhu to stay during the four months of Chaturmasya, which was soon to start. Mahaprabhu, as a sannyasi, accepted his request. Vyenkata Bhatta directed his son, Gopala Bhatta, to render all services to Mahaprabhu during this period, and Gopala Bhatta with great sincerity took care of Sri Mahaprabhu’s every need. As a result he received great benefit by Mahaprabhu’s association. Being pleased with Gopala Bhatta’s devotional affection, Mahaprabhu gave him initiation and ordered him that after the disappearance (death) of his parents he should go to Vrindavana to live there, performing bhajana, devotional service, and writing books. 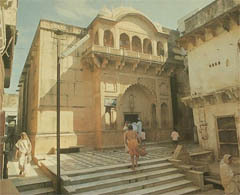 At the age of thirty, after his parents disappeared, Gopala Bhatta went to Vrindavana. When he reached there, he heard that Mahaprabhu had already visited Vrindavana and had returned to Puri. Hearing this, Gopala Bhatta was disappointed, thinking that Mahaprabhu had never ordered him to visit Him in Puri. Mahaprabhu, however, through Rupa Goswami and Sanatana Goswami, sent Gopala Bhatta His personal asana (seat) and cloth as signs of His blessings. In Nepal, Gopala Bhatta visited the Gandak River and took his bath there. After his bath, he filled his waterpot, but was surprised to see that some shalagrama-shilas had entered it. He emptied them back into the river and refilled his water pot, but again he saw that some shalagrama- shilas had entered his water. pot. He emptied his waterpot one more time, and upon filling it a third time, he saw that now twelve shalagrama-shilas were there. Thinking that this must be some mercy of the Lord, he decided to bring all the shalagrama-shilas to Vrindavana. Gopala Bhatta gave initiation to Gopinatha Dasa, a brahmacari who lived with him and rendered him all services. One day a wealthy man came to Vrindavana and offered Gopala Bhatta all kinds of dresses and ornaments for his shalagramas. Gopala Bhatta, however, told him to give them to somebody else, since his shalagramas were of a round shape and therefore the dresses and ornaments could not be used. This incident made Gopala Bhatta think deeply. It was Nrisimha Cahturdashi, the appearance day of Lord Nrisimhadeva, and Gopala Bhatta remembered how Lord Nrisimha, in His form as half- lion, half-man, had come out of a pillar. Gopala Bhatta prayed to the Lord, “O Lord, You are very merciful. You fulfill all the desires of Your devotees. I wish to serve You in Your full form.” He read the pastimes of Lord Nrisimhadeva in the Srimad-Bhagavatm, and after chanting in ecstasy he fell unconscious. The next morning he awoke to find that one of the twelve shalagramas, the Damodara shila, had manifested as Sri Radha Ramana. He informed Sanatana Goswami and Rupa Goswami. 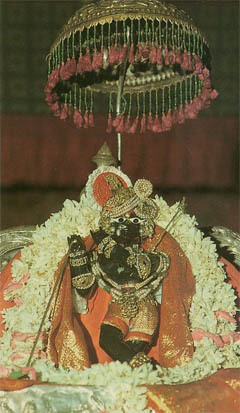 Gopala Bhatta started serving Sri Radha-Ramanaji. After some years, however, he became concerned: after his disappearance, who would continue the service of Sri Radha- Ramana? He asked Gopinatha Dasa, his brahmacari disciple, to get married and take the service of Sri Radha- Ramana as a hereditary duty. Gopinatha Dasa did not want to marry but suggested his younger brother, who was married. Gopala Bhatta agreed and initiated him. After the disappearance of Sri Gopala Bhatta Goswami, this disciple, known as Damodara Dasa Goswami, continued the worship of Sri Radha- Ramanaji. Since then the Goswami families descended from Damodara Dasa Goswami and, spiritually, from Gopala Bhatta Goswami have continued the worship of Sri Radha-Ramana very nicely in Vrindavana to this very day. Before preaching in the West, Srila Prabhupada, the Founder- Acharya of ISKCON, was for many years a close friend of Sri Vishwambhar Goswami, an acharya in the line of Gopala Bhatta Goswami. Srila Prabhupada advised his devotees to learn the high standard of Deity worship and Vaishnava etiquette from the Sri Radha-Ramana Temple. Many times Srila Prabhupada visited the Sri Radha-Ramana Temple and was very much impressed.